NEWTON, IA — Cornell senior Kyle Dake stepped off the NCAA’s raised championship mat on Saturday night, March 23, and into the history books. He became only the third wrestler in history to win four NCAA titles, but the first to do it at four different weights. To cement his legacy on the sport, he moved up a weight class to 165 pounds to face the best collegiate wrestler in the country from 2012 and his friend David Taylor of Penn State. He defeated Taylor for the third time this year — in the NCAA finals — counting an unofficial All-Star meet at the beginning of the season. And now he has added college wrestling’s most prestigious individual honor, the 2013 WIN Magazine/Culture House Dan Hodge Trophy, presented by ASICS. Dake received 39 of 43 first-place votes from the Hodge Voting Committee. The committee is made up of all former Hodge Trophy winners, national wrestling media, retired college coaches from different regions of the country and a representative from a number of national wrestling organizations. Penn State junior Ed Ruth, now a two-time NCAA champ after his dominant run through the 184-pound class, grabbed the other four first-place votes and finished as the Hodge runner-up in total points as well. When notified of winning the Hodge, Dake’s response showed his elite-level mentality and why he is considered one of the sport’s greatest of all time. “It’s pretty awesome,” he said. “It’s always been in the back of my mind where I’m the most dominant out there. I wanted to be a three-time Hodge winner with Cael (Sanderson). But it didn’t work out. It came across my mind when I lost that dual meet (a January 2011 loss to Binghamton’s Donnie Vinson) that all the other top guys would have to lose for me to win the Hodge. Sanderson, the Penn State coach who has led the Nittany Lions to three straight team titles, is one of only two multiple-time Hodge winners in the 19-year history of the award. He won three Hodges from 2000-02. The other multiple-time winner was Ben Askren of Missouri, winning in 2006 and 2007. Dake’s “pretty good” four-year career started without even a redshirt season. The former two-time state champ from Lansing High School just down the road from the Ivy League, Ithaca, N.Y. campus, started at the 141-pound class and jumped up one weight each year, winning titles each March. The likely finals bout and rematch with Taylor was so highly anticipated that the NCAA made an unprecedented finals programming decision. The order of the finals was adjusted so the 165-pound match was the final bout and the main event of the night. And it lived up to its billing with Dake winning by a point, 5-4, on riding time. Dake’s dominant senior season included 18 pins in his 37-win campaign. He was unscored upon in his four NCAA tournament matches leading up to the finals. Dake wins the 2013 Hodge from the most loaded individual field in the award’s 19-year history. Three of Dake’s peers had such dominant seasons themselves that they would have easily won the award considered the Heisman Trophy of wrestling by numerous media outlets any other college wrestling season. Ruth put up 12 pins in his 33-win season and finished second in the voting in total number of placement points. There were only six matches this season in which the talented junior didn’t score bonus points. Two of those were to last year’s champ, Steve Bosak of Cornell. He also put up an impressive 12-4 major decision over 2011 NCAA runner-up Robert Hamlin of Lehigh in this year’s NCAA finals. For the first time, fans were invited to vote for the Hodge Trophy on WIN Magazine’s website. Over 2,500 fans voted as of Thursday, March 28. Fans went a different direction from the rest of the Hodge Voting Committee, selecting Ruth the overall Hodge winner over Dake. With the composite fan vote resulting in two of the official 43 ballots, the fan vote pushed Ruth ahead of Oklahoma State’s Jordan Oliver as the Hodge Trophy runner-up, 89-88, in final placement points. Four points were awarded for a first-place vote, three for second, two for third and a point for a fourth-place vote on each of the official ballots. Oklahoma State’s two-time NCAA champ in Oliver was the 2011 Hodge runner-up to reigning Olympic champion Jordan Burroughs with his title that year at 133. He finished third in the Hodge standings this year after moving up two weight classes to win the title at 149. The Cowboy finished a spotless 38-0 season with 17 pins, only one less than Dake. Ohio State sophomore Logan Stieber finished fourth in the final voting. He won his second straight NCAA title in as many tries, beating No. 2 Tony Ramos of Iowa twice in the last two weeks of the season. Amazingly, opponents in only five of 27 bouts all year — Ramos accounting for two of them — were able to keep from getting pinned or teched by Stieber. Stieber actually recorded the highest pinning percentage of the Hodge finalists at 52 percent, pinning 14 foes. Dake now moves onto his freestyle career on the Senior level, competing for a spot on Team USA. That road will have to go through Burroughs, himself a Hodge winner for the University of Nebraska in 2011 before going on to win the World Championships that fall. Dake said he’s ready for the challenge of having to beat Burroughs and others to make the U.S. team. “I want to win the World Championships this year, and win the next couple Worlds and then the Olympics. I want to stamp my name as the best in the world. If you’re not trying to be the best at what you do, then you’re wasting your time and you need to go find something else to go be mediocre at,” he said. Dake said if he was going to win a World or Olympic title, he’d have to beat the best guys in the world anyway. With the current scenario of having to defeat Burroughs, the Big Red senior could line up against the top man in the world at 74 kilograms in only three months at this June’s World Team Trials in Stillwater, Oklahoma. When Cornell coach Rob Koll was asked about what separates Dake from other elite-level wrestlers, he was quick to talk about Dake’s laid-back personality and ability to be unaffected by big-match pressure. “Kyle gets excited for matches when others get nervous. It’s a negative emotion vs. a positive one. The negative one makes you tired, the positive one gets you ready,” Koll said. The award, founded by wrestling historian Mike Chapman of Culture House Books, has seven criteria. They are, in order of importance: season record, number of pins, dominance, quality of competition, previous credentials, sportsmanship/citizenship and heart. 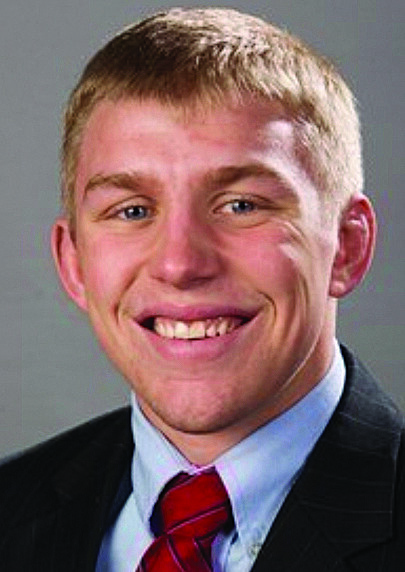 Dake will be publicly presented the award at the Cornell wrestling banquet in Ithaca, N.Y., on May 5. For more information on the Dan Hodge Trophy, visit www.WIN-magazine.com.